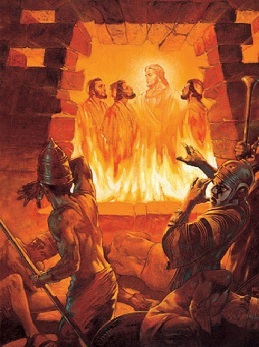 Fiery Furnace - After Daniel interpreted Nebuchadnezzar's dream and the king learned he was the head of gold, the compliment evidently went to his own head, for he erected a giant statue made of gold. Daniel's three friends Hananiah, Mishael and Azariah (whose Babylonian names were Shadrach, Meshach and Abed-nego, see Daniel 1:7) were in attendance at the unveiling. Little did they know of the surprise that awaited them. "Nebuchadnezzar the king made an image of gold, the height of which was sixty cubits and its width six cubits; he set it up on the plain of Dura in the province of Babylon. Then Nebuchadnezzar the king sent word to assemble the satraps, the prefects and the governors, the counselors, the treasurers, the judges, the magistrates and all the rulers of the provinces to come to the dedication of the image that Nebuchadnezzar the king had set up. 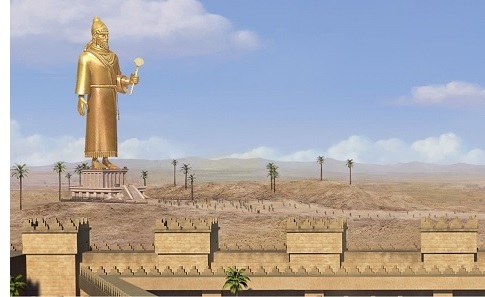 Then the satraps, the prefects and the governors, the counselors, the treasurers, the judges, the magistrates and all the rulers of the provinces were assembled for the dedication of the image that Nebuchadnezzar the king had set up; and they stood before the image that Nebuchadnezzar had set up. Then the herald loudly proclaimed: 'To you the command is given, O peoples, nations and men of every language, that at the moment you hear the sound of the horn, flute, lyre, trigon, psaltery, bagpipe and all kinds of music, you are to fall down and worship the golden image that Nebuchadnezzar the king has set up. But whoever does not fall down and worship shall immediately be cast into the midst of a furnace of blazing fire.' Therefore at that time, when all the peoples heard the sound of the horn, flute, lyre, trigon, psaltery, bagpipe and all kinds of music, all the peoples, nations and men of every language fell down and worshiped the golden image that Nebuchadnezzar the king had set up. For this reason at that time certain Chaldeans came forward and brought charges against the Jews. They responded and said to Nebuchadnezzar the king, 'O king, live forever! You, O king, have made a decree that every man who hears the sound of the horn, flute, lyre, trigon, psaltery, and bagpipe and all kinds of music, is to fall down and worship the golden image. But whoever does not fall down and worship shall be cast into the midst of a furnace of blazing fire. There are certain Jews whom you have appointed over the administration of the province of Babylon, namely Shadrach, Meshach and Abed-nego. These men, O king, have disregarded you; they do not serve your gods or worship the golden image which you have set up.' Then Nebuchadnezzar in rage and anger gave orders to bring Shadrach, Meshach and Abed-nego; then these men were brought before the king.